United Nations Security Council will convene Monday upon France's call for an emergency meeting over Syria following the launch of Turkey's anti-terror operation in northern Syria's Afrin province. "Ghouta, Idlib, Afrin — France asks for an urgent meeting of the Security Council," French Foreign Minister Jean-Yves Le Drian said on his Twitter feed. He added that he had spoken with his Turkish counterpart Mevlüt Çavuşoğlu on Sunday morning. The foreign ministry said Monday that the U.N. meeting on Syria initiated by France under the framework of "Any other business (AOB)" will address latest developments in the country, according to a message sent by French officials to representatives of U.N. member states. "I would like to inform you that we will also use tomorrow's AOB on Syria to focus on the humanitarian situation in the country and to address more generally the latest developments of the situation in the field," the message said. 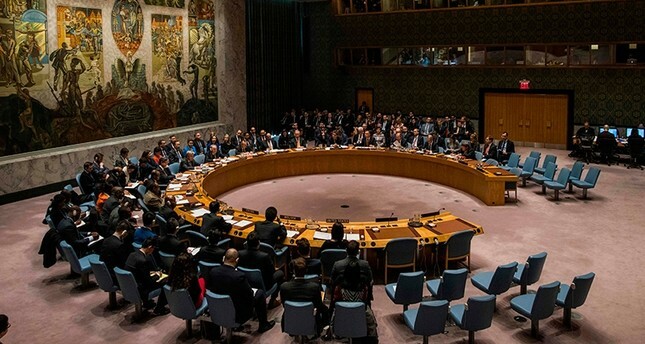 On Saturday, envoys and mission chiefs of permanent members of U.N. Security Council — United States, Russia, United Kingdom, France, China —were invited to the Turkish foreign ministry for a briefing on Operation Olive Branch.